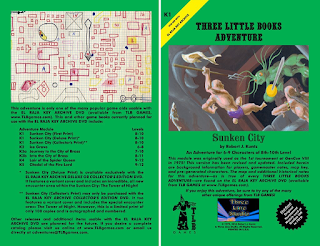 Along with the recent release of the El Raja Key Archive, a collection of Rob Kuntz’s scanned gaming materials, comes Sunken City, the first D&D tournament module ever (originally run in 1975 at Gen Con VIII). While the two are linked, it makes sense to discuss them separately, since they are rather different products: one an exhibit presenting historical documents; the other reconstructing and expanding one of the documents for use. This is an important point, because the original scenario, most of which was improvised, only survives in the form of the map and a reference chart, with the GM’s notes being lost. Consequently, what we get today is neither a 100% original game artefact nor something modern, but a combination of the two. As available, the module comes in the form of a small booklet, roughly the size to fit inside a DVD case. The cover is detachable, a decision which makes little sense since the map is not reprinted on the interior – a missed opportunity even at the cover’s small size. Instead, the reader is referred to either the archive, or a free download from the TLB Games site which contains the high-resolution scans. With that out of the way, Sunken City manages to be both authentic and refreshingly original. While the cover illustration and the limited description suggest an underwater adventure, this is not entirely correct: the city of Kalibruhn, devastated by a tidal wave and flooding, is only half-submerged, with the lower buildings sunk below the surface, but the taller ones still standing high above the waterline. The core feature of the module is the colour-coded map, which ingeniously incorporates these building height variations into a single sheet. This “compression” of information requires careful study at first, but presents an adventure in a varied and three-dimensional environment which requires a continuous adaptation of player strategies. It is a fascinating map whose whole is much more than its seemingly “primitive” building blocks (certainly, the map looks like no real city ever), remaining fresh more than 40 years after its debut. The initial part of the module provides a discussion of how environmental issues can impact play. There are unsound structures, sinkholes, randomly assigned encounters which try to “control” their surrounding territory and may become permanent fixtures, and other hazards the characters must contend with. If the characters use rafts to get around, they must use nearby terrain to pole around, or entrust themselves to the currents (which may just put them in terrible danger). It is nice to see a scenario where these concerns are being considered while also letting high-level characters use their resilience and respectable arsenal of spells and magic items to traverse and exploit the complex terrain. Moving around the city is part of the experience! It seems a bit overwhelming in places (tracking character weight is an element to look out for), and demands forethought to pull off, but the resulting challenge should make the exploration all the more memorable. The 23 keyed areas present what you would find in a lost city adventure: temples, the residences of the former inhabitants, administrative structures, and so on. Mapping out individual buildings is an exercise left to the GM, but the contents are sufficient to run the adventure (one location is missing stats for a bunch of higher-level thieves, but this can be remedied). There is a variety here that’s not entirely random (since it is all thematically fitting), but doesn’t get stuck in repetition and offers a decent number of non-obvious fantastic elements and a few surprises. It is not a huge place, about the size of TSR’s smaller modules, but there are some neat opportunities for diving and spelunking and fighting interesting opponents without getting tangled within a forced plot. It is mostly the right kind of classic design; recognisable but original at the same time. This is not to say Sunken City is without flaws. First comes a common problem with high-level modules: it compensates for excessive character power with excessively powerful opponents. Make no mistake, “special” monsters posing a harder challenge have place in the game, but in Sunken City, just about everything is an upgraded, advanced or special version of some monster or another. Indeed, there is even an evil necromancer who is so special that he finds regular magic-user spells beneath himself, and uses his special “ancient spells” (one of them a good old sword&sorcery classic) and special magic items to deal with the intruders. This is more inflation than ingenuity. Second, while less common than in some of Rob’s other modules, “­hidden depth” remains a problem. This is the kind of ultra-obscure content or puzzle which you have to flip backwards thrice through flaming hoops to find or solve. There is a major mystery in the module whose key lies in things like finding a specific object within a pile of extremely common-looking objects, combining one obscure item with another obscure item, and/or deciphering a completely opaque clue that was probably only ever clear to the author. Then there is a rather important object which shows up in a randomly assigned minor treasure cache – not that random plot item assignment is a bad idea (the card reading in Ravenloft remains the yardstick to measure any similar device), but here, the concept is stretched to the point of obscurantism. Finally, at a few places, the straightforward, to the point design is replaced by some rather baroque solutions or counter-intuitive descriptions. This applies to some encounters (and especially that necromancer), but also extends to the mechanics. The module makes a big deal out of things like how certain buildings collapse, or how character weight figures into all this. While this is in the interests of fairness, it seems more trouble than it is worth. Similarly, some arcane rolls to avoid certain effects could be easily resolved with... how do you call those things... saving throws? These are the high points and flaws of Sunken City, and if it wasn’t clear so far, the former outweigh the latter. Indeed, at its best, Sunken City combines conceptual simplicity with inventive execution, and like TSR’s early releases, it offers something new (in this case an interesting 3d environment with varied hazards). It is one of those modules which could have easily been a TSR release in the pastel series, minus the few muddled parts. After wrapping one’s head around it (which takes some time before it clicks), and simplifying a few rough corners, it will be a worthy addition to a module repertoire. Is there really no pdf version available? Nope. This is a product that seems to be targeted at the collector community, who don't really deal with PDFs, and aren't too price-sensitive. Also (obviously no fault of the publisher), be warned that my order was held up for weeks by the Hungarian Post, and slapped with a hefty 27% duty.